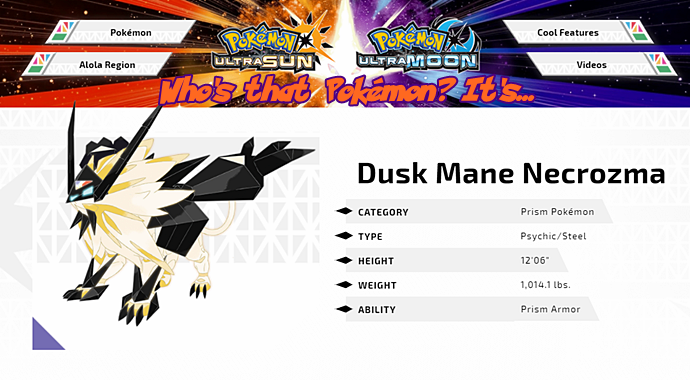 Dusk Mane Necrozma controls both the body and mind of the Legendary Pokémon Solgaleo, absorbing the light energy that pours out of it. Dusk Mane Necrozma can propel itself forward by shooting black light from both sides of its chest, giving it a powerful means of propulsion. By taking Solgaleo into itself, Necrozma’s Attack rises beyond its previous level. It slices opponents with the powered-up claws on its four legs. The power greatly exceeds that of Solgaleo. Players can expect it to be a great aid in battles using physical moves, including Sunsteel Strike. Photon Geyser is a Psychic-type special move that only Necrozma can learn. This attack engulfs the target in a pillar of light. Necrozma can learn this move when it’s in its Dusk Mane or Dawn Wings forms, as well. This move compares the user’s Attack and Sp. Atk stats, and it deals damage according to whichever is higher. This means that both Dusk Mane Necrozma, with its extremely high Attack, and Dawn Wings Necrozma, with its extremely high Sp. Atk, can unleash the effects of this powerful move to the fullest. Tags: Dusk Mane Necrozma, Feature, Pokemon, Pokemon Ultra Sun, Who's That Pokémon? Categorised in: Feature, Nintendo, Pokemon, Pokemon Sun & Moon, Who's That Pokémon?